Very Very Vicky: Gorgeous New Old Stuff! Two reasons for this: (1) I can afford better goods if I buy them used and (2) the house will have more character, look more collected over time, if some of the things are vintage. When I looked over the pictures of the dining room to select some to share I realized that almost everything in it was owned by somebody else first. I wanted a pagoda chandelier for the dining room. I love the bamboo look--it's beach-y and elegant but not stuffy. Most of the ones I looked at were out of my price range. So I began searching for one on eBay. It took some time but patience paid off and I found this vintage tole pagoda for an amazing deal! A coat of spray paint (Rustoleum aqua) and boom--it looks fresh and ready for it's new life at Tybee! Peter and I couldn't wait to take down the old fan and put it up. My dining table and chairs were scored by searching Craig's List. I paid for the table and six nice, heavy chairs with rush seats less than I would have spent for one chair new. 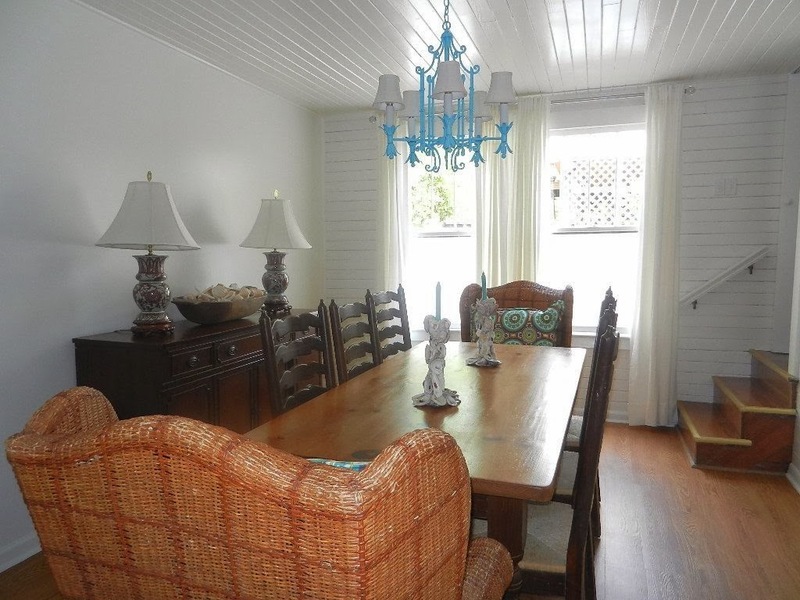 The wicker chairs at each end of the table also came from another Craig's List search. I wanted a buffet or sideboard piece for the white sheetrock wall and this one came from a flea market. The gorgeous vintage Imari lamps also came from a flea market and I was able to get them for less than I would have spent at a discount store. They came with wonderful black silk shades but I bought some white ones--it's a beach house after all. I'd have put a pretty painting above the buffet if I had not sold the house. Maybe one like this one by Bellamy Murphy. Here's a link with some of her paintings--what a talented lady! Remember the fabulous shell mirror from this post? It was a special anniversary gift from my husband Henry. 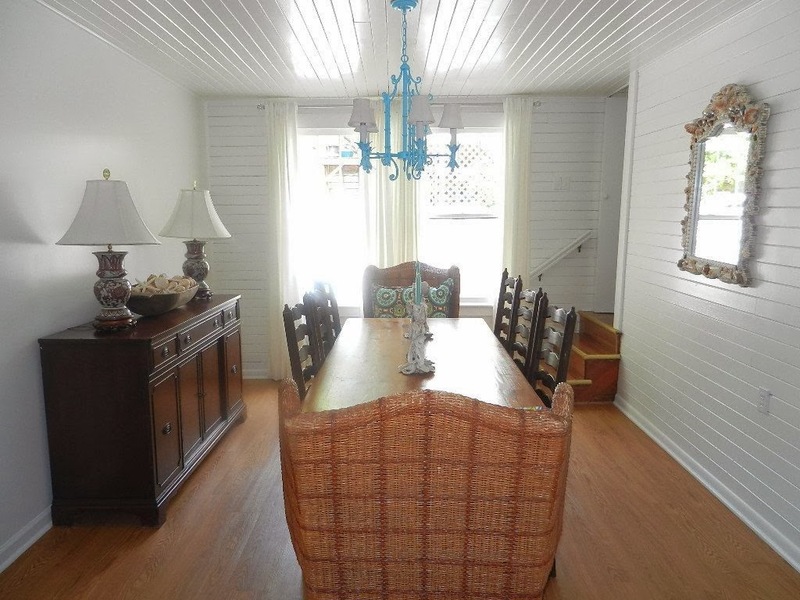 It wound up coming with us to Doc Holiday when we sold the house but I originally planned it for this dining room. The curtains are from Ikea--this style with grommets is called Merete. My designer Jane Coslick arranged these shells in an antique bread bowl. Aren't they fantastic? It's the little details that make everything magical. Don't you love the oyster shell candlesticks....Jane's son made them! What do you think? Pre-loved stuff is not so bad, huh? Sometimes old things used in a new way can look fresh and beautiful. Who wouldn't like having dinner in a dining room like this? 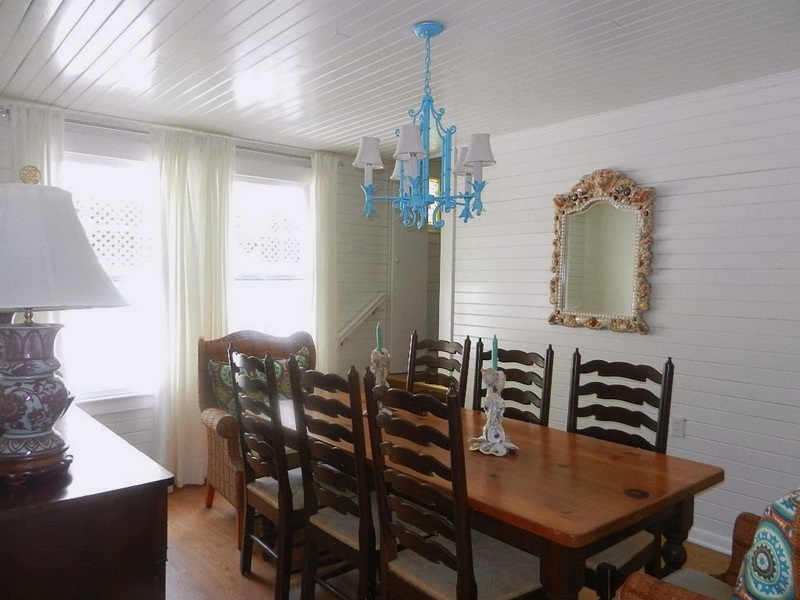 Love the bright aqua paint effect. You have done a beautiful job with the dining room. Thanks Kathy! Spray paint is like a miracle worker!